You Think You Can Bike to Kouang Xi Waterfalls? I’ve never ridden a mountain bike before. It was over 90 degrees Fahrenheit. I did not research the topography of our route. We had 2 bottles of water and 1 roll of Ritz crackers. Josh did not think it was a good idea. I consider myself to be in pretty good shape. I’m stubborn and very competitive. 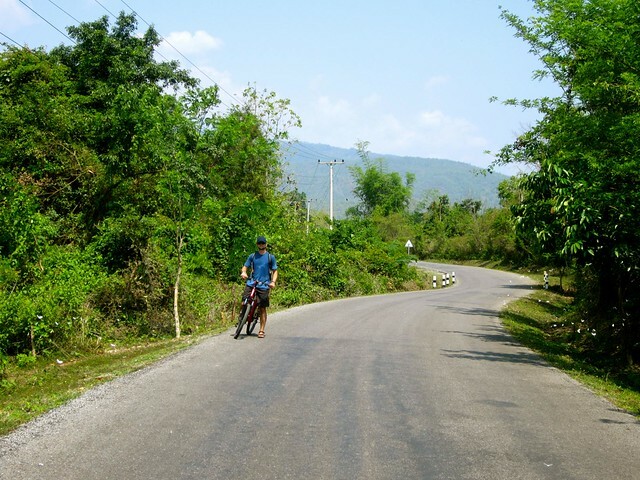 It sounded simple enough, you follow one major road to Kouang Xi from Luang Prabang. Low risk of getting lost, mountain bikes are easy to rent, and it is only 30 km each way. We walked 12 miles in Bangkok, so I figured if we were on two wheels the trip would be a piece of cake. 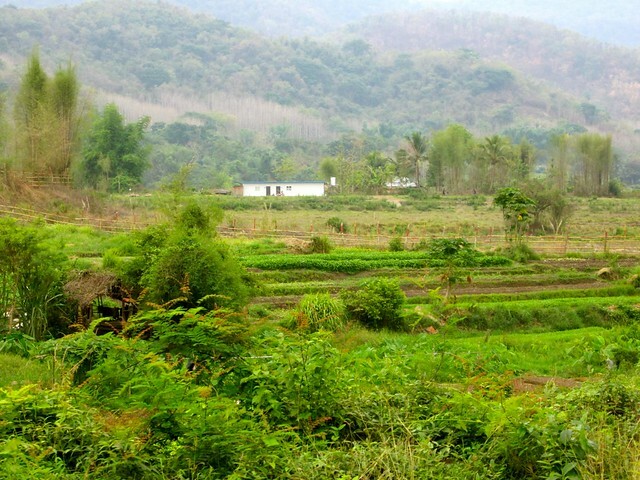 This was my mindset the morning we woke up early to ride our bicycles to the Kouang Xi waterfall outside Luang Prabang. I had read a couple of blogs saying it was difficult, but they had done it. My stubbornness and competitiveness (see above) kicked in and I was convinced we could complete this seemingly moderate bike trip. I should have considered that this was the first time that Josh wasn’t 100% excited about our plans and didn’t think it was a good idea. Despite his better judgment, he supported my stubbornness, climbed on a bike and tried to teach me how to use the changing gears. It helped that we started biking around 9 am so the sun wasn’t in full force yet. The scenery was breathtaking. 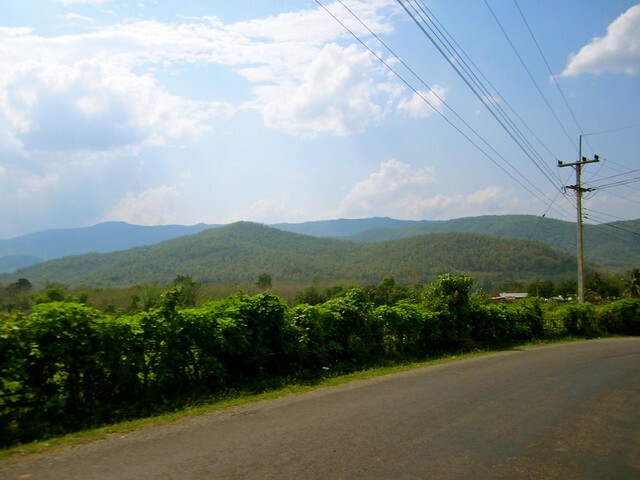 Photos can’t capture the beauty of the rolling mountains, lush greenery and endless roads. I love the feeling of being so small amidst natural untouched land that carries on for miles. Let me remind you these rolling mountains we were approaching, we had to bike through. We pedaled past small villages and hundreds of cattle. If we saw a photo opportunity we tried to stop, hoping that it was in the shade and we could take a quick drink of water. By 10 am it was hot. The bike route had not been too bad at this point, we were tired but our energy was still high and we were still conquering one hill at a time. You could see the faces on the tourists in the tuk-tuk’s, in disbelief that we were attempting to make it up a hill that their tuk-tuk was sputtering up. The last hill before you reach the falls was the worst. We were pedaling as fast as we could, almost at a stand still with another tuk-tuk as the engine pushed hard to make it up and we had to laugh as the guests in the vehicle just stared at us (probably glad they weren’t in our shoes). Reaching the waterfalls was worth the climb. I think we enjoyed it even more because of the hard work put into the trip. If you get a chance to make it to these waterfalls, whether via tuk-tuk, motorbike or bicycle I highly recommend going! The water is a perfect aqua color that appears fake, each level boasts a different lagoon that you can take a dip in to cool off from the heat. We preferred arriving early before the bus trips come and bring crowds of people. The earlier you arrive, the more time you can spend with just you and the waterfalls. The tough thing about a 2 hour bicycle ride to the waterfalls is the 2 hour return trip. We were drained of energy, so we took a few hours to re-coup at the falls. 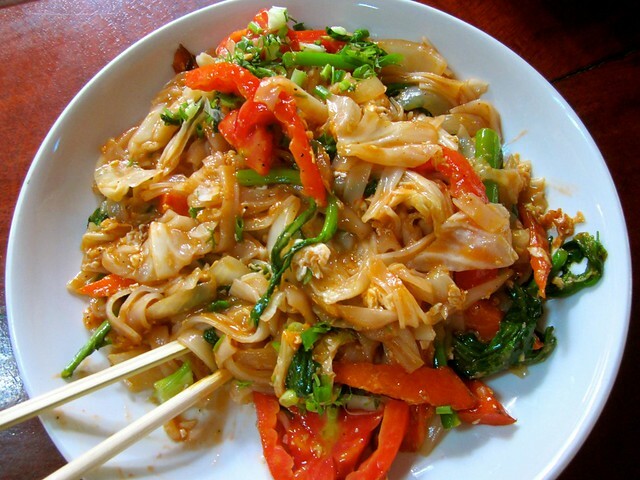 The cool water and huge plate of noodles did the trick, around 3 pm we were back on the bike. The good thing about working really hard to go up a hill, is that the downhill is exhilarating and worth the climb. We flew down the hills (Josh much faster than me since I was a bit nervous of flying off my bike.) It was great not pedaling for a couple of kilometers, only coasting, enjoying the scenery and welcoming the breeze! Our ride back was fun because the kids were out of school and since it was 2 days before Lao New Year they were out and waiting for us with buckets of water. Every small village we rode through got us soaking wet. In a way it was welcome since we were both so hot, but it did made the handle bars very slippery to hold on to during some of the bumpier parts of the road. 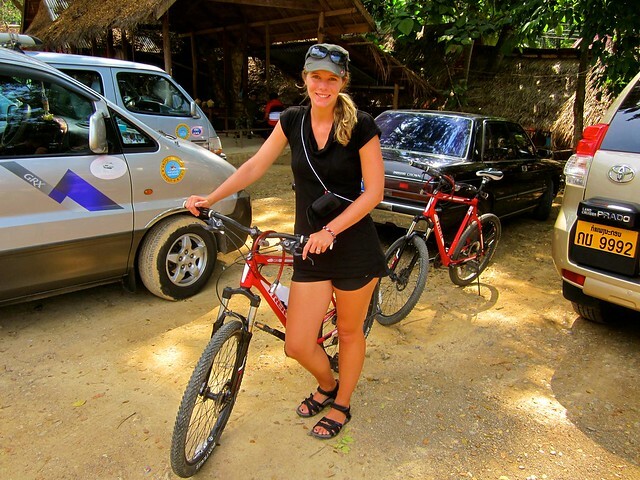 Renting a real mountain bike costs about the same as a tuk-tuk should to the waterfall. You don’t save any money, but you may have a much richer experience providing your own transportation! Those photos are absolutely amazing! You are right, it looks like a movie set. I have been following along with you on your journey and I am so happy for both of you. It looks like a truly once in a lifetime experience. You have already convinced Maria and I that we need to do the same in another year or two. I have a million questions for you when you get back, so we will need to catch up for dinner at some point so I can pick your brains. This is the best kind of tourism: nature, exercise, good food, slow pace, nice landscapes. Congrats on the choice! Hi Carolyn and Josh, you should have come in the tuk tuk with us. Amazing photos and wonderful narrative. 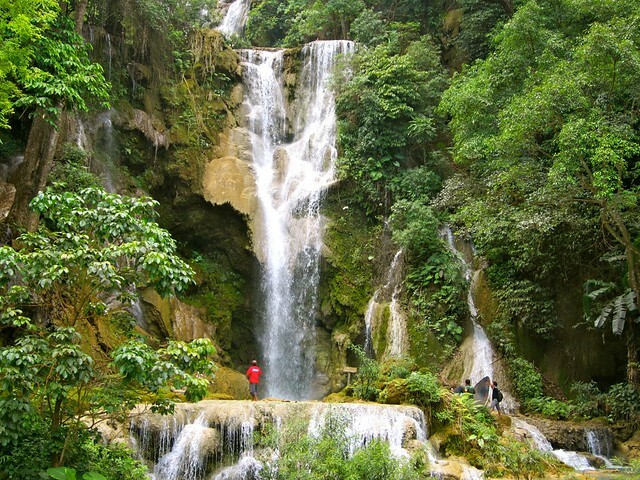 The waterfalls are certainly spectacular and worth the trip whether it be by bike or tuk tuk. You were good sports, with smiles on your faces, as usual! Looks beautiful though the 36 mile round trip journey sounds intense! 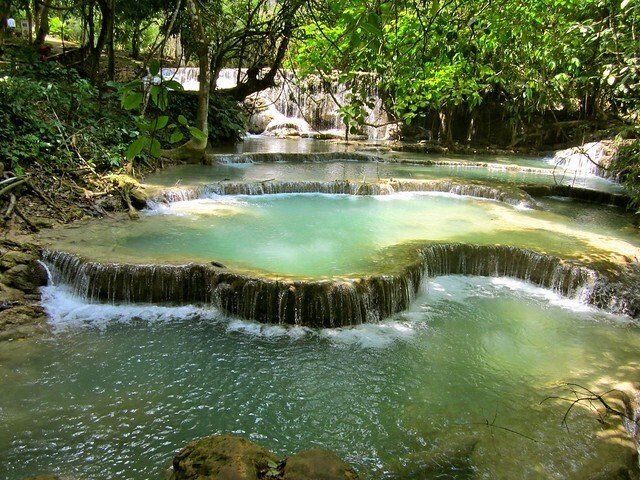 I’ll have to add this into our Laos itinerary! Intense.. and a little stupid.. but it was totally worth it!